I had no idea what to expect from Loving Day when I requested it from NetGalley. The site describes Mat Johnson's fourth novel as "a brilliant and biting ghost story about family, real estate, race, and the dream of utopia." I'm not sure a person could fit more loaded terms into a vaguer blurb, but I was on the hunt for another work of fiction that tackled racial identity head-on after having such a good experience with Dwight Ritter's Growin' Up White. The book opens by immediately thrusting the reader into the largely disappointing life of Warren Duffy. Coming off a bitter divorce and an equally bitter failure to break into the comic book world, he moves back to his hometown of Philadelphia after his father bequeaths him a dilapidated mansion in the city. In the span of one afternoon at a comic book convention, he meets two people who will completely change the course of his life. Through his experiences with a biracial community group (the aforementioned "Mulattopia"), Warren changes heart, even arguing with one of his closest black friends that "[h]aving people acknowledge all of their ethnic heritage doesn't mean they're abandoning social justice" (Loc 3676). It was only when I looked Johnson up that I realized just how much of Loving Day is autobiographical. Johnson is of black and Irish descent, and he even wrote a comic book of the same name as Warren's one claim to illustration fame. As someone who knows very little about the lived experience of mixed-race individuals (I'm part-Cuban, but it isn't a huge part of my life as an otherwise white-as-hell Jewess), seeing how closely Johnson's experiences paralleled those of Warren's lent a lot of authenticity to his character. So, major points for tackling tough topics. The story itself? To be honest, I found it a little convoluted, at times in ways that took away from the value of Warren's transformation of identity. There were just too many different things going on. If you don't mind a zany plot, I definitely recommend the book for anyone looking for some frank discussions about being black (and/or being biracial) in America. 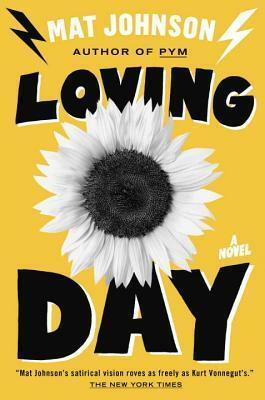 Loving Day is available for pre-order and will be released May 26, 2015. Obligatory disclaimer goes here: I received Loving Day from NetGalley in exchange for an honest review. Thanks so much to Random House Publishing Group for giving me the chance to read it! Has anyone else read Loving Day? Let's chat! Wow, this sounds super interesting if not confusing haha. I guess I don't REALLY mind a zany plot, but it depends. That line "The asterisk is my whole body" is just so good. I'm tempted, but unsure about this one. Hi, Lynn! Glad you enjoyed my review. Ah, I hope you write about Growin' Up White soon! I really, really enjoyed it and thought it offered a unique perspective. Ooh, I'd love to hear more about what Ritter is like! Yes, that line is good. Johnson is a really great writer. Yeah, it's... I don't know. I don't even actually know that it was that wild, but it just felt like too much to my brain. I'd say check it out of the library and see how you feel. I finished reading Loving Day myself on Monday. I liked it, but I can't really articulate the reasons why. Probably because it was funny and I like his writing style. Yeah, his style is great, and there were moments that had me chuckling out loud, but overall it just wasn't my book. I'm glad you enjoyed it!